Electrical boxes for every need! Metal or non-metallic, inside or out, Mier Products has you covered! Vehicle Detection at its best! Select indoor or outdoor enclosures to find your product by size or product description. Can’t find the enclosure you want, or want something custom? Visit our custom design page, or call 800-473-0213. The industry leader in metal and polycarbonate electrical enclosures, custom fabrication and Drive-Alert vehicle detection and asset protection systems! 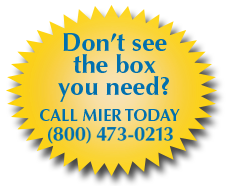 Mier Products, Inc. is the manufacturing specialist in electrical enclosures, custom fabrication, and Drive-Alert vehicle detection and asset protection systems. For more than 30 years, Mier has been recognized as a provider of high-quality products, all made in the U.S. Quality, innovation, and customer satisfaction is the driving motivation behind the culture at Mier. You don’t have to own a manufacturing plant to realize the benefits of one. With Mier as your fabrication partner, you can leverage their years of experience and competitive pricing in over 500 standard-line products, as well as small to large custom runs. Use their proficiency to design and build metal or polycarbonate enclosures and fabricated parts, or set-up the ideal Drive-Alert system to meet your specific installations. Using Mier’s enclosures or Drive-Alerts will enhance and distinguish your products from all others, in addition to saving you assembly and installation time and expense. Whether you utilize the expertise built into their standard-line of products or use it to assist you in developing a custom product for your exact application, you are certain to benefit from Mier’s knowledgeable staff and their sincere appreciation for your business. For help choosing the best product for your needs, call 800-473-0213 or email info@mierproducts.com. Check out our MIER PRODUCT CATALOG for all models, specs, comparisons and ordering information. If we don’t have it, we’ll work with you to create it! At Mier Products, We’ve Got You Covered! Many fabricators require large quantity runs for custom work, but Mier has the ability to design and produce small quantities economically. Using their “Design-A-Box” format, available on the website, custom enclosures and parts can be quickly designed, prototyped and produced. Mier is equally at home in producing larger volume and/or complex and intricate products, with an eye on keeping costs in line by controlling the fabricating processes. Mier also offers many accessories, E-coating, powder coating, screen printing, labels, color choices, multiple special features, NEMA Ratings, and even approved UL Listings as finishing touches. Our standard line of enclosures range from simple junction boxes, to NEMA outdoor temperature controlled enclosures, and feature a multitude of paint colors in powder coat, ideally suited for the indoor or outdoor environment chosen. Mier is the pioneer in developing driveway alarm systems. As a frontrunner in development, Mier offers constant refinement and new techniques in the detection of vehicles and movement of assets. Mier’s Drive-Alerts include hard-wired and wireless models, with an array of accessories to address any installation demand. Drive-Alerts are ideal for residential, agricultural and commercial use, including drive-up window applications. Exp erience and caring drive the level of quality, innovation, and customer satisfaction at Mier Products. They are included with every order we ship! From helping you find exactly what you want, to the arrival of products at your door, you can count on our experience and our commitment to our customers. Whether you utilize our expertise built into our standard line of products, or use it to assist you in developing the perfect custom product for your application, you are certain to benefit from our knowledgeable staff and their sincere appreciation for your business. The management and production teams at Mier bring years of experience to the table with a pledge of quality, service and competitive pricing.